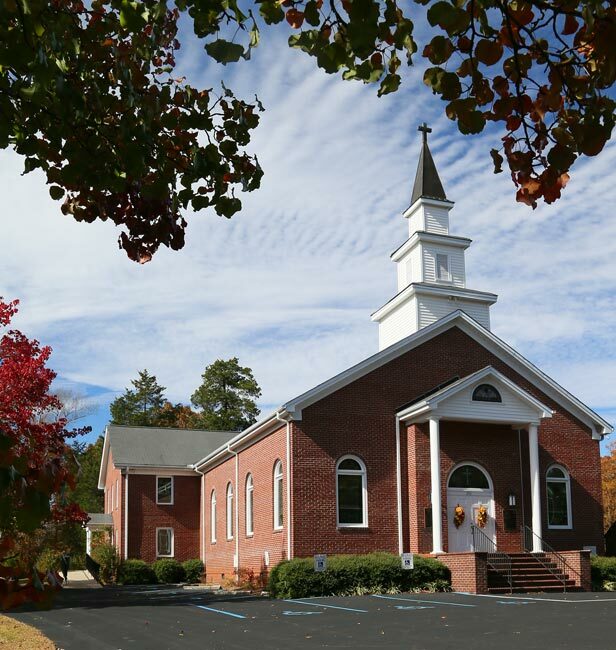 The land on which this church in Pickens County sits was donated by the area’s first settler, Cornelius Keith of Virginia, who arrived in 1743 to what Cherokee Chief Woolenoy described as the “land of grain and clear water.” The two men formed a treaty soon after Keith’s arrival, and more settlers followed. 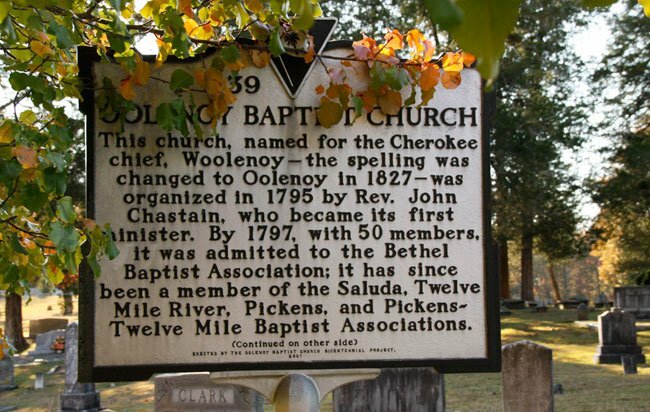 The natives and the new homesteaders lived peacefully together, and much of the surrounding land was named for the Cherokee leader, though shortened to the English pronunciation, Oolenoy. Oolenoy Baptist Church was organized in 1795, and the first church building was made of hand-chopped white oak (Quercus alba). Baptisms took place in the nearby Oolenoy River. In 1840 residents acquired an up-and-down saw and built a new plank church along with a wooden baptismal pool, eliminating chilly winter submersions in the river. Members upgraded to a circular saw in 1780, purchased from Augusta, Georgia. They used the new saw to remodel the church several times over the subsequent years. By 1946 the present church was built, which contained a new baptismal pool that replaced the plank one. Renovations continued until 1952, when the building was restructured in brick. The Oolenoy Baptist Church Cemetery was established ca. 1798 in the Pumpkintown community of Pendleton (later Pickens) District. Its significance is derived from its age, its association with the early settlement and growth of the South Carolina upcountry, and as a cemetery containing the graves of persons of transcendent local importance. It is also significant for its association with Oolenoy Baptist Church, of which it is adjacent to, founded in 1795 and the first church established in the Pumpkintown community. The cemetery is an excellent example of a typical early nineteenth century to mid-twentieth century church cemetery illustrating vernacular burial customs and gravestone art of the period. The cemetery contains 839 marked graves, with headstones, footstones, and a few plot enclosures of granite, marble, fieldstone, or soapstone. Most gravestones are marble or granite tablets, though ledgers, box-tombs, tomb-tables, obelisks, and pedestal-tombs are also present. The earliest marked grave dates from 1798, and occasional burials still occur. I have a will of my 4th great grandfather, James Southerland/Sutherland written in 1843. He set aside one-half acre of land whereon the Baptist Church now stands for the use of the said church. I am wondering if this could have been Oolenoy Baptist Church. James probably owned about 1,000 acres of land in and around Sutherland Mill Creek, Ooleny Creek/River from about 1800 to his death in 1844. Any information you can give me will be appreciated. Thanks. There is a link to the church above the map. I hop that helps! Cornelius Keith was my umptieth-great grandfather … on both sides of my family! (Hey, I'm southern, no biggie.) There's a nice marker at his grave in the cemetery that was paid for by my grandmother and some other relatives, probably back in the 1950s.